All praise belongs to Allah; Jalsa Salana UK took place last week and with Divine grace those who attended it and those who saw it on MTA around the world benefited from its blessings. The feedback received by Hazrat Khalifatul Masih is most positive. People felt that there was a lot of improvement in the overall arrangements and the speeches were of a higher scholarly and spiritual standard. As traditional, Huzoor based today’s sermon, the first after Jalsa Salana, on presenting an overview of the event in light of Divine blessings. He also thanked all the volunteer workers and mentioned a few deficiencies. With the grace of Allah, the atmosphere of Jalsa Salana affects each pious-natured soul. Some non-Muslims and non-Ahmadis only come to the Jalsa to find out how real are the blessings and beneficences of Jalsa as expressed to them by their Ahmadi friends. After experiencing Jalsa majority of them acknowledge that they find their experience to be greater than envisaged and some are so impressed and affected that they end up taking Bai’at. This year two Russian guests took Bai’at after observing the Jalsa atmosphere. Although guests from Guatemala, Chile and Costa Rica from South America did not take Bai’at during Jalsa, but it left a great mark on them and later on, during mulaqat with Huzoor they expressed regret at not taking Bai’at earlier and acknowledged they had recognised the truth and wished to take Bai’at. Thus, six people, four men and two women took Bai’at yesterday after Zuhr Prayer. Among those who took Bai’at this Jalsa was a friend from Guatemala whose origin is Jordanian. He said that he observed the practices of unity, love and affection at Jalsa which the Holy Prophet (peace and blessings of Allah be on him) wished for. He felt Jalsa organisation was excellent and was most impressed by the discipline, sense of sincerity and unity. He said Jalsa was an illustration of the Hadith in which the Holy Prophet (peace and blessings of Allah be on him) said that believers are like one body and any pain in one part of the body is felt by the rest of the body! He prayed that may Allah reward all Jalsa workers. A friend from Costa Rica said that he was most impressed by the excellent arrangements put in place by the Jama’at and how each worker performed his duty. He said he was delighted to have discussions with guests from other countries and felt his faith had enhanced. He said the advice in the addresses of Hazrat Khalifatul Masih was meant for the entire Muslim world without any distinction between Sunni or Shia Muslims! A lady from Costa Rica said that attending Jalsa was a unique experience and the mutual love of people of different ethnicities left a great mark on her. She felt the spiritual atmosphere of international Bai’at was redolent of the time of the Holy Prophet (peace and blessings of Allah be on him). These were some of the attendees from Guatemala, Chile and Costa Rica, who, having seen the international Bai’at at Jalsa, were completely convinced yesterday and took Bai’at. The Ahmadiyya Jama’at disseminates the beautiful message of Islam and each visitor can see its display of love and affection which compels them to be part of the true Islamic model or at least their objections against Islam are negated through it. This is a proof of the fact that Islamic teaching has never been outdated and Divine help and succour has never left Jama’at Ahmadiyya. Once a family told Huzoor that in Pakistan one of their elderly ladies was against the Jama’at. They lived in an extended family situation but she never came to Jalsa. Once she had to go to Rabwah and the family also took her to Jalsa. There she saw the spiritual atmosphere, the organisation of the Langar Khana and listened to the speeches and was so impressed that she took Bai’at. This was during the time of the second Khilafat. Indeed, during each Khilafat people have attended Jalsa and taken positive influence from it. This is a sign of the truthfulness of the Promised Messiah (on whom be peace) and is also a sign that Divine help and succour is with Khilafat e Ahmadiyya. These matters do not come about through human effort. The atmosphere of Jalsa is a silent source of Tabligh in which each Ahmadi worker is a silent missionary. Guests from outside was most impressed to see the silent, seamless flow of work by all volunteers, without panicking, without harsh speech; men, women and children all are engrossed in serving others. Jalsa acts as a great source of enhancing the faith of Ahmadis who attend Jalsa for the first time while it recharges the faith of long-term Ahmadis. Some guests honestly express that they look out for faults and this year even such people have said in general that the level of cheerfulness displayed by workers has been greater than before. Next Huzoor present comments of some distinguished Jalsa guests. The Speaker from Kinshasa, Congo said that it was his first visit to Jalsa and he saw the entire proceedings including international Bai’at. He felt everyone at Jalsa interacted with each other as old friends. He said they once tried to hold an event on provincial level at home where due to disorganisation 26 people died on the first day. He was amazed at the organisation of Jalsa where no one even spoke in a raised tone and small children served drinking water most lovingly. Children usually like to have everything for themselves but the Jama’at has thus trained its young children that they put the comfort of others first. He wrote that after attending Jalsa he went to his embassy and told the ambassador that he had attended many a conference but had never seen one with the excellent organisation he saw at Jalsa. The Foreign Minister of Benin said that he did not have the words to express praise for Jalsa organisation. He saw extraordinary fervour to serve among children and adults including the elderly who had no concern for themselves and only wanted to make Jalsa successful. He said he has seen the world and has experienced arrangements made by a super powers like the USA but has never seen excellent arrangements like he saw at Jalsa. He said the secret behind the strength of the Jama’at was their Khalifa and also said that today only Jama’at Ahmadiyya is working for peace and brotherhood! Defence Minister of Uganda said that it was not possible to express what he experienced at Jalsa. He saw the exhibition and also had mulaqat with Huzoor when he told Huzoor that only an army could bring about the discipline he saw at Jalsa Huzoor remarked that even his [Ugandan] army could not organise such discipline, he agreed! A guest from Greece who does Greek translation for the Jama’at sent an email saying that it was not a small matter to see such a large number of people gathered in such a peaceful way for the sake of love and peace and to pray. He said Jama’at Ahmadiyya does not simply give hand-outs to the underprivileged people in fact it helps them stand on their own feet through various projects and is most humble in spite of all its services. He said he experienced no complaint from anyone during Jalsa and saw all the volunteers helping out cheerfully. They all worked extremely hard at serving the guests and all of them wanted the guests to feel completely at home at the Jamia where they were staying. A television director was among the guests from Nigeria. He said that all the arrangements at Jalsa were of international standard and the speeches were excellent. The Bai’at ceremony left a deep impression on him. He said he felt very emotional in the presence of Hazrat Khalifatul Masih because he could see how all Ahmadis submitted before their Khalifa. He said he had never before witnessed such love and affection as shown by all those present at Jalsa and he said on return home he will tell others that this what all Muslims need to adopt. A lady newspaper assistant editor from Nigeria said that having attended the Jalsa she realised that every member of the Jama’at had sentiments of love and affection for each other and everyone greeted each other with a smile and was ever ready to help each other. She said she has been a journalist for eighteen years and could say without hesitation that only Jama’at Ahmadiyya was a true Islamic model. Men and women both greeted guests with love and friendliness and she had never seen this at any other Islamic event. The mayor of a city in Belgium said that he was made aware of the true teachings of Islam after attending the Jalsa and he saw with his own eyes how this teaching was put in practice by Ahmadis. He could see mutual love and affection in their eyes. Before coming to Jalsa he had only seen the Jama’at on a local level. However, after Jalsa he had seen how it operated on an international level and felt that it practiced what it preached. He felt the arrangements at Jalsa were excellent and he was taking back sentiments of love and affection. He had visited the stalls of Humanity First and Engineers Association and was amazed how the Jama’at was serving humanity. He felt his appreciation of the Jama’at was enhanced after the Jalsa. A vice mayor of a city in Belgium said that he experienced Islam at Jalsa contrary to how the media depicts it. He felt it was a great virtue to spread the true message of Islam and unite all humanity. He said he had observed how the Jama’at strove to serve humanity in his city, however, after coming to Jalsa he now realises that that the Jama’at strove to serve humanity throughout the world. He felt there was no other faith which was serving as the Jama’at was. He was very impressed by the diligence of the duty-holders at Jalsa and felt that if people back home worked just as hard perhaps his country would not have experienced the economic downturn that it faces. Wife of a vice mayor of a city in Belgium said that she experienced unique love and affection when she visited the ladies Jalsa Gah. There was an amazing atmosphere when Hazrat Khalifatul Masih came to the ladies Jalsa. Thousands of women listened to his address in silence. She said she found the answers in Huzoor’s address to the questions she had in mind regarding women and Islamic teachings. She said in the beginning she felt a little nervous in the ladies Jalsa Gah but once Huzoor’s address started her feelings were allayed. A friend from Belgium who is under Tabligh said that he has known about Ahmadiyyat for a long time but it was his first experience of attending Jalsa. He said he saw everything in the three Jalsa days and would say without hesitation that Ahmadiyyat was the true model of Islam. He said he saw people weeping in prostration and this had left a deep mark on him. A guest from Malta who is a social worker said that what he liked best was young child serving drinking water. He also liked the instruction of Hazrat Khalifatul Masih to comply with whatever instruction the workers were given even if they came from young people. He said he was impressed to note that in a Jalsa booklet advice was given not to waste food and only take what could be easily eaten. He was please the Jama’at paid attention to minute matters. A journalist from Malta who is also a television host and has known the Jama’at for three years interviewed Huzoor. He said it was evident to him that the Jama’at has made great progress in 125 years and was now established in 206 countries. He felt this could not be possible without Divine held. Referring to the discipline at Jalsa he said wherever there is discipline, there is God. Huzoor remarked this person is a Christian. He said that on his return to Malta he would prepare an hour long documentary for his TV station based on Huzoor’s interview and the Jama’at. An academic who teaches philosophy in a college in Malta said that he would write a detailed article on the proceedings of Jalsa so that others could also benefit from the advice given at Jalsa regarding religious and worldly well-being. Ahmadi as well as non-Ahmadi guests from French Guiana also came to Jalsa. Among them was a Christian professor who said that when he was invited to Jalsa he did not understand why these people wanted to invite him. However, he now understood that the significance of Jalsa was not limited to the Jama’at; in fact it was a significant event for the world. He said he derived amazing peace when listening to the recitation of the Holy Qur’an and has obtained audio recordings of the same. Many journalists came to Jalsa this year, from here and from abroad. A Hindu lady journalist said that her mother had warned her not to go to an event of Muslims as they were dangerous people who may kill her and no one would find out. She said after experiencing Jalsa she plans to tell her mother that Ahmadis were more peaceful than Hindus and felt that her mother should also experience the beautiful teachings given at Jalsa. A lady journalist from Belize, where Jama’at was established this year, came to Jalsa. She is also a TV anchor. She said that Jalsa experience proved to be more pleasant than she had expected. She had reflected on our motto of ‘Love for all hatred for none’ and felt that indeed, she experienced love all around Jalsa. She said she would always remember what the Jama’at gave to her and she thanked all those who gave duty at Jalsa. She said she was born to a very strict Sunni Muslim family and in reaction to their harsh ways she abandoned Islamic teachings but still believed in God. Her experience of Jalsa was unique where she felt no Ahmadi girl or women was restricted in any way and went about their business freely, roamed in the bazaar and met each other lovingly. She said she felt had she been born in an Ahmadi home she would not have reacted as rebelliously as she did with her family. She said she had made many friends at Jalsa. Huzoor said Ahmadis should be grateful to Allah that they were born to Ahmadi families or had accepted Ahmadiyyat and are thus protected from the elements that make others rebellious. Huzoor said some Ahmadi girls also react badly at times, they should remember that others are also impressed by our ways, so they should not suffer from any complex. Teaching of Islam is in accordance with human nature. A lady journalist guest said that she was a religious person who shunned alcohol and tobacco and went to Church regularly. However, she did not ever experience the respect she felt at Jalsa at her Church; she said she felt very special at Jalsa. A non-Ahmadi friend from Kazakhstan thanked Hazrat Khalifatul Masih and the Jama’at from the bottom of his heart for inviting him to Jalsa. He said as a religious scholar who had researched different faiths for half a century he found our motto Love for all hatred for none most attractive. This was something other Islamic movements had not reflected over. In the current times of turmoil when extremism is at its height and religious intolerance is widespread it was only the Ahmadiyya Jama’at which was working on mankind-friendly projects to once again illuminate the world with the teachings which have been inherent in the religion of Islam from the beginning. It is true that these teachings are close to the hearts of tens of millions as indeed they are close to the Kazakh people. This is the fear the so-called religious leaders have and this is why they are trying their utmost to harm the Ahmadiyya Jama’at. 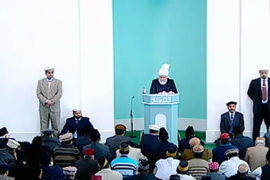 Huzoor said prayers should be made for the safety of Kazakh Ahmadis. Many distinguished guests came to Jalsa from Sierra Leone. One of them said that Jalsa was broadcast Live on Sierra Leone television and was also viewed by the country’s President. After watching speech by Tommy Kallon he rang one of his delegates present at Jalsa and sent congratulations for the Jalsa. Minister of Legal Affairs of Trinidad and Tobago came to Jalsa and said that the Jama’at’s love for Hazrat Khalifatul Masih could not be described in words. He said the Jalsa organisation was tremendous and one could sense that God’s hand was behind the Jama’at. He said he was greatly moved by attending the Jalsa. A group of guests also came from Croatia including five Catholic ladies and four ladies from a university. Head of a Muslim Centre in Zagreb also came along with three Catholic men. The head of the Muslim/Arabic Centre said that he had attended countless events in many different countries but had never seen the sincerity with which young children served drinking water at Jalsa. He was also very impressed by the service of the students of Jamia and other youngster volunteers. A lady member of the delegation said she wondered when the volunteers took rest, adding she had never seen such devoted volunteers before! A student member of the delegation said that she was most satisfied with the answers Huzoor gave to her questions and felt that if the Muslim world sought the guidance of Huzoor their problems would be solved in a peaceful manner. Another university student also expressed satisfaction over the answer Huzoor gave to her question. Director of the Ministry of Culture of Haiti was also a Jalsa guest. He said he was delighted to attend Jalsa and having seen the organisation of Jalsa he felt that Jama’at was an exemplary community for the rest of the world. He said he was amazed to see everyone work at Jalsa and admired them all, both young and old. Next Huzoor presented comments of some new comers to the Jama’at. A lady from Mexico said she learnt many things by coming to Jalsa. Not only was she made cognisant of the reality of life but she also realised the reasons behind the current state of the Muslim world. She said she used to feel that the sect she belonged to was fine but after attending Jalsa she realised that it was here that the blessed model of the Holy Prophet (peace and blessings of Allah be on him) was followed. She used to pray to be included in the best of people and be guided by rightful Khilafat. She felt God had listened to her prayer by enabling her to join Jama’at Ahmadiyya. A new Ahmadi from Belize said that three days of Jalsa made him realise the extensive scope of Jama’at. He felt the organisation of Jalsa was carried out in a captivating style. He met with people from over eighty countries belonging to different backgrounds. He appreciated that numerous volunteers worked hard to make Jalsa a success. Sadr Lajna of Marshall Islands, who is a new Ahmadi, said that attending Jalsa was a huge blessing for her. She observed everyone had sentiments of love for each other which was an embodiment of the motto of the Jama’at, Love for all hatred for none. She had amazing feelings during the addresses of Hazrat Khalifatul Masih when each word brought tears to her eyes. She also found the experience of the Bai’at ceremony most wonderful. An African American Lajna related one of her dreams to Huzoor. In the dream she is offering Salat in a beautiful and very large mosque and does not recognise all the people in there and each time she feels that she is in a different country. After attending Jalsa where people from all over world offer Salat together she felt she had seen the fulfilment of her dream. A new Ahmadi from Mexico said that he felt people from different countries of the world were filled with love for the Khalifa of the time. He said Jama’at is an exemplary community and was an embodiment of the teachings of Islam. An Imam from Mexico who had come into Ahmadiyyat with seventy of his followers said that he felt numerous blessings of God coming down during Jalsa. Huzoor’s speeches not only increased his knowledge but also gave him inner peace. Every attendee of Jalsa as if bore witness that Islam is a religion of peace. A new Ahmadi from Panama said that he was most impressed by the organisation of Jalsa and the love and unity expressed by everyone. He said he felt a revolutionary change had come about in his life. An Ahmadi from French Guiana who took Bai’at in 2008 came to Jalsa for the first time. He said that he was a born Muslim who was the first Ahmadi in French Guiana. Now that he had attended Jalsa, he truly realised the significance of Ahmadiyyat and of the Khalifa of the time. A friend from Belgium said that when he first went to an Ahmadi mosque he experienced love and affection which he also felt at Jalsa. He took Bai’at during the international Bai’at and said that it was not possible for him to express what he felt during Bai’at. By meeting Hazrat Khalifatul Masih he experienced first-hand that indeed a Khalifa is appointed by God. A friend from the Philippines who took Bai’at last year came to Jalsa. He said he had found what he was looking for by attending Jalsa. God willing he now aims to spend the rest of his life as an Ahmadi Muslim. He felt the loving enthusiasm of the volunteer workers at Jalsa was commendable. He saw them work from morning till night and this wondrous experience won his heart over. A friend from Mali who took Bai’at Jalsa said that the feelings he experienced during Jalsa were feelings he had never before felt in his life. He felt even if our opponents tried their level best they could not organise even a fraction of an event like Jalsa Salana. He added that even a great power like the UNO could not manage to organise an event like Jalsa. A friend from Kazakhstan said that he had been to Jalsa many times before but it was his first experience to stay at the Jamia. He commended the arrangement to accommodate people from different countries in one place as it promotes to forge strong connections. Most of all this facilitates offering congregational Salat in great numbers. He said this was quite important for him as back home they are not able to offer congregational Salat in large numbers. With the grace of Allah this year the central press team and the UK press team both worked very well and for the first time Jalsa coverage was good through which the message of Ahmadiyyat, true Islam reached people. Through the contacts of the central press team press and media had also come from abroad and they all made positive comments. The message of Ahmadiyyat reached about 13 million people in the UK. Articles are still being written and news disseminated and it is estimated that the message has also reached around 12 to 13 million people outside the UK. With regards press and media Huzoor said people of different faith or no faith come to Jalsa and are impressed with it. Anyhow they have their own dress code and their own traditions. Some ladies do wear modest clothing when they come over but do not wear scarf although some do take scarf. However, even if they do not take scarf we cannot bind them to do so. Some of our men have hard-line attitude and resort to rigidity. A BBC lady correspondent came to Jalsa whose head was not covered at some point. A man came from behind and put her scarf on her head. The correspondent is known to an Ahmadi and was wearing modest clothing and had earlier also had her head covered although at that time it was not covered. She laughed off what the man had done but did say that another person in her place may have been offended or could have had negative impression. Huzoor said men should remember that they have not been given powers to police others and should restrain themselves. It is not for them to cover the heads of women from outside. Men are commanded to restrain their eyes; they should fulfil their own obligations. There is not even any commandment to forcibly cover the heads of Muslim women let alone non-Muslim women. It is men like these who have hard-line ideas, there may be the odd one among us also, who bring Islam in disrepute. Huzoor said no one should think that they are the caretakers of reforming the world! Similarly a man told an Ahmadi who accompanied another lady journalist to tell her that it was necessary to cover the head in our surroundings and that she should cover her head. Huzoor said he would say to such men that they should take care of their own families first, the world will InshaAllah be reformed of its own accord. It is acts like these that turn people away from Islam. Huzoor said he had earlier recounted the story of a lady journalist who had turned away from Islamic practice due to the harsh stance of her father. When she saw the freedom [of Ahmadi women] at Jalsa she wished that she had been born in an Ahmadi home. Women should reform women especially in Europe where there is a furore that Muslim men are harsh and unfair and cruel to Muslim. Such actions by men spoil matters. These things should be handled by women with gentleness. Lajna does its work and in any way it does not matter because [when visiting our events] lady journalists dress modestly in keeping with their standards. With the grace of Allah MTA plays a large role in broadcasting Jalsa programmes as it did this year. While Ahmadis have expressed delight at this, others have also given good comments. Response of non-Ahmadi Arabs has been very good. They have said that this indeed is true Islam and have also said that this is also the true Khilafat which the Muslim Ummah is in need of! MTA broadcasts were shown live on the national channels of Ghana and Sierra Leone and on a private channel in Nigeria and were very well-received. A comment from Ghana said that they had heard a lot about the Jama’at and were astonished to see MTA because their Imam had told them many falsehoods about the Jama’at! A non-Ahmadi lady decided to become an Ahmadi, an Ahmadi wrote that they had seen the international Bai’at ceremony for the first time and felt very proud to be an Ahmadi. Another person wrote that after seeing Jalsa proceedings he had understood the philosophy of the Jama’at and had decided to become an Ahmadi. Many people had sent in comments that they would soon join the Jama’at. A Christian friend wrote from Sierra Leone that watching the live proceeding was very blessed, another person wrote that they invited their neighbour over to watch Jalsa proceedings, another comment said what a magnificent Jalsa it was and many said that Jalsa broadcast had been very well-received by non-Ahmadis. In Nigeria perhaps one million people saw Jalsa proceedings on television. About 330,000 people watched Jalsa through live streaming; this is in addition to viewing on MTA. We should remember that positive feedback should inspire us to move onwards and upwards rather than make us rest on our laurels. Progressive communities are ever looking to improve themselves. We are aware and we should always be mindful that there can also be weaknesses. Weak points can occur in an organisation of this large scale, it is not that critical. However, they should be noted down and the management should remedy them for the next time. These weaknesses do not only occur because of the workers but can also occur because of some obstinate attendees. There should be arrangement for this as well and they should be trained/tutored before coming to Jalsa. Huzoor has been notified that a woman sat in the main marquee with children. When a worker noticed this she informed the woman that mothers and children had a separate marquee. In response the woman said she was not aware of this but now that she was made aware she would leave. Later the worker realised that this woman guest was not an Ahmadi, so she apologised to her and said that if her children were quiet she could carry on sitting in the main marquee. Meanwhile an Ahmadi woman sitting close by started arguing with the worker and said if she did not have a problem why did the worker had a problem? Thankfully the worker acted sensibly and did not let the matter escalate and went away quietly. Then the woman asked is it in Hadith that sitting there [in the main marquee] was not allowed! Such obstinate women need to change their attitude. Mostly women behave in this manner although sometimes men do too! Thankfully people sitting in the area did not notice all this. Huzoor said as far as the question of Hadith is concerned; it is in Hadith as well as the Holy Qur’an that no matter from whom an instruction comes, it should be complied with. Compliance of the Ameer is enjoined and the Holy Prophet (may peace and blessings of Allah be on him) said that even an Ameer whose head is the size of raisin is appointed over you, listen to him. Such rebellious attitudes should not be taken on small matters; whether something is in Hadith or not. Indeed Hadith says obey and comply and this is very essential for everyone who calls themselves an Ahmadi. Huzoor instructed workers to note down for the next time that if someone shows such attitude they should inform their superior who should then cancel the AIMs card of the individual disallowing them to attend Jalsa. Huzoor said Jama’at Ahmadiyya does not need such rebellious attitudes. Other than this there was also a complaint from women’s side that at times the toilets were not so clean. People have praised the food and the roti this time. May Allah enable us to further improve on it! Another complaint was received from the women’s side that an elderly person was not served food because she was late. No matter who comes for food at whatever hour, especially the ailing, children and the elderly, and there is food, then they should be served. In fact arrangements should be in place to serve such people at any time and it should be explained to them that they are being given special service. They should also be politely told that they have come for food late for some reason and should be given the food serving hours. However, the stance should be compassionate and loving. This year they experimented by installing toilets in tents on a large scale and this was appreciated. The Russian guests complained about transport facilities. They stayed at the Jamia but the transport arrangements were not adequate as a result they arrived late at Jalsa and missed part of the early proceedings. Likewise return to Jamia was also late which meant that they missed offering Tahajjud. Huzoor said the transport systems needs to be improved and this should be noted down in the Red Book. With the grace of Allah, on the whole the Jalsa went very well and the guests were happy. May the good influences of Jalsa become part of our lives! Huzoor said just as the guest had thanked the workers he too thanked the men and women workers. May Allah reward them and accept their service and enable them to serve in a better way next time! May their service be not simply outwardly but may the spirit of Islamic teachings be instilled in them and may Allah make the attendees and the workers both true Ahmadis!